Injuries are of no concern to new Luton signing Alan McCormack as he insisted he has finally got on top of the problems that blighted his final year with Brentford. The 33-year-old was restricted to just 12 appearances last season for the Bees after consistently breaking down on the training field according to boss Dean Smith. I want to come back very, very fit for the first day, then have a good pre-season which just makes you fitter and stronger. Although not completing 90 minutes during the campaign, McCormack did return to feature in the final stages of the season, as he said: “The little niggles have been awkward little things. “A couple of them were my own fault, coming back from a niggle too quick and trying to do too much, getting back into training and the body wasn’t quite ready. “I was doing nothing for 10 days, two weeks and then you’re doing sprinting and during the sprint, they’re telling me to slow down and I’m sprinting even quicker. “Unfortunately the body broke down, as the injury that you’d have just wasn’t ready for that kind of work yet. “So two or three were my own fault and a couple were just a little bit of unfitness and being in games, and not warmed up properly. “They’re very much, very little things that can be eradicated. Coming to Luton can only help prolong McCormack’s career too, as he confirmed the level of expertise amongst Town’s medical department was a huge factor in him signing. He continued: “I had a couple of injuries last year that niggled me and kept reoccurring, that towards the end of the season we finally got on top of with a great programme. With Town’s players back at the end of this month, McCormack had no worries about being able to hit the ground running, saying: “I gave myself 10 days, two weeks of complete rest at the end of the season, I didn’t do anything, a couple of games of golf, that’s it. “I then started back, doing some runs and then I got the programme that the lads have sent through to me. “I feel I’m in pretty good shape at the moment and I want to come back very, very fit for the first day, then have a good pre-season which just makes you fitter and stronger. “In today’s game, the one thing I’ve noticed over the years is you’ve got to be fit and strong, that’s the whole point of doing a bit of work in the off season. “You get two or three weeks off and you’ve got to come back on the 26th of June ready to go. “You need to be on the ball straight away and if you’re not fit you just can’t do that, you start picking up niggles. McCormack is also looking beyond his career with Luton as he hopes to maybe play a part behind the scenes when he finally hangs up his boots, although that’s still some way in the future. He added: “I’m taking my coaching badges, as I want to do that when I’m finished. 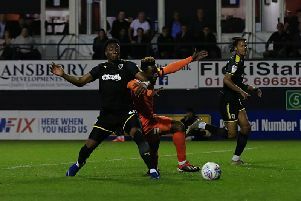 “I’m going to be doing some more at Luton and if things go well, there could be a possibility of staying on in that front, but that’s not even at the front of my mind.